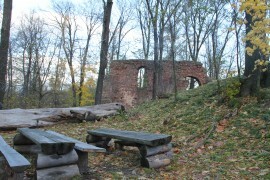 An impressive ruin of the early Gothic castle is located on a wooded humb nearby Bohušov village in Osoblaha region. 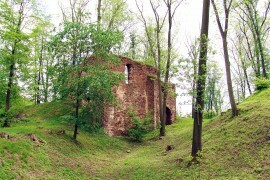 Once this was an important seat of Supa family of Fulštejn and Sedlnický family of Choltice, established in the first half of the 13th cenutry by Herbort of Fulm. His son Ekryk took over the administration of the castle in 1302. Lords of Fulm governed the caste until 1437, when it came under the administration of Jindřich Sup of Fulštejn. The castle remained under Jindřich´s administration until 1460. In 1476, when Matyáš Korvín took his campaign, the castle was besieged, conquered and damaged. Shortly after that, the castle was reconstructed again by lords of Fulštejn. In 1496, Jan Sup became the administrator of the property. In 1542 he forwarded the administration to his sons – Ekryk, Jiří and Jan. Later, only Ekryk and Jan were responsible for the property. At that time, many nobility members in Silesia accepted Luther´s doctrine, whose admirer was for example Jan Sup of Fulštejn. He appointed Luther´s priests in his mansions and built up Luther´s churches. In 1565 he gave the castle to his brother Jiří, who sold the castle by return in 1566 and surrounding property to Václav Senior Sedlnický of Chotice. Karel Kryštof Sedlnický of Choltice, who took over the administration of the castle in 1617, was an active member the Estate resistance. Therefore his whole property was confiscated. During the Thirty Year´s War Danish and Swedish troops took their campaigns through the mansion. Until that, the mansion was thriving, but after invasions it was completely destroyed so that it became uninhabitable. 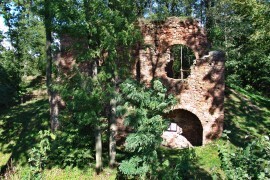 Since the 18th century, the castle has been stated as a ruin. In the south-east part of the rear castle there are ruins of a three-spatial building, which was continuously built between a large tower in the east corner and a smaller one in the south corner. The eastern tower is a round building with a large floor plan diameter. In front of the tower and a periferal rampart in the east corner, there was a shield wall to protect. Next preserved object is a tower in the western part and remains of a rectangle-shaped building in the south-west part. A part of a western periferal rampart and remains of the entrance gate in the nothern corner are preserved from the front part of the castle. A dominant of the front castle is the building in the south-west corner, just opposite the tower of the rear castle. 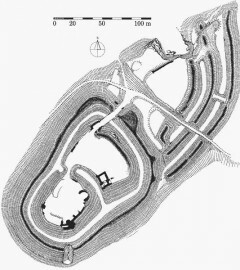 Defence of the castle was supported by a massive artillery bulwark coming out of the front rampart and two smaller bulwarks on the eastern side of the same rampart. How to get to the ruin? The shortest way how to get to the ruin is from Bohušov railway station. Stand back to the railway station building, towards rails and turn right and go along the rails and after 300 m turn left and climb a steep hill and steps to get to the ruin ( about 200 m). The ruin is freely accessible and with no admission.